The addendum was signed at the Centro Biotecnológico Agroforestal Chaco, during a conference dedicated to that theme. Dr. Salvarezza delivering his speech in the province of Chaco. Photo: CONICET Photography. The president of the National Scientific and Technical Research Council (CONICET), Dr. Roberto Salvarezza, participated in the first conference at the Centro Biotecnológico Agroforestal Chaco to sign both an addendum for cottonseed and an agreement for royalties. On this occasion, two other meetings were held at the same ceremony: the CONABIA conference and the fifth meeting on Agrobiotechnology and Biosafety between Argentina and China. 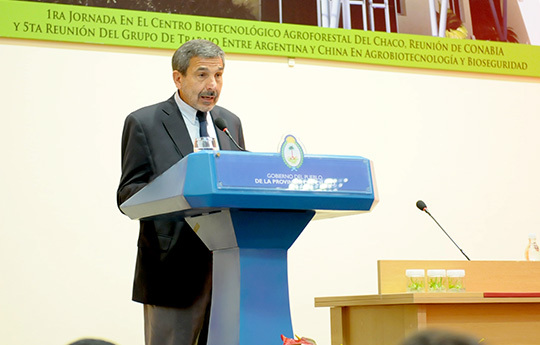 The event, which took place at the facilities of the Centre next to the Escuela de Jardinería [Gardening School]Nº 13, was attended by Jorge Capitanaich, Chaco Province Governor, the minister of Science, Technology and Productive Innovation, Lino Barañao, and the director of the Centre, Jorge Ruches. “I met José Ruchesi two years ago, when the challenge was to take the seeds and reach the plants. Today, we sign this agreement and produce cotton”, Salvarezza commented during his speech. Besides, he added that “The Gardening School became a strategic partner of the CONICET, just as our partnership with the Max Planck institute of Germany or other European institutions”. Furthermore, the president of the Council highlighted the exponential scientific growth after the 2001 crisis, a moment in which the latent threat of the closure was present in the institution, until this current period in which there are ten thousand fellows and nine thousand researchers all over the country. “We aim to promote national integration in terms of science and for that purpose we our main challenge is to transfer scientific knowledge to the society”. Nowadays, there are 600 small and medium sized enterprises that demand the services of the researchers at the Council. “In the last decade, there was an increase of 45% in transference. This means that local companies rely on the institution as a reference”, the president indicated. Just as in 2013 Y-TEC, the Council’s company that went into partnership with YPF, was created, Salvarezza announced that there is going to be a new company devoted to plant biotechnology. It will be called Q-ARAX and it will have the necessary space and capacities to develop crops and technology transference in the different regions of the country. Apart from the participation of the CONICET, this national firm will have other partners: Escuela de Jardinería, Estación Experimental Agroindustrial Obispo Colombres of Tucumán, Agrogenética Riojana SAMEP, and Biofábrica de Misiones S.A.
Minister Lino Barañao spoke about the importance of scientific transference and how it became valuable for the research area. For his part, Capitanich expressed his admiration for the scientific policy carried out in the last decade by the promotion of the national government. He also highlighted the importance of the agreement and the addendum between the CONICET and the Escuela de Jardinería to boost cotton crop. “We have a motto here, which is ‘sembrando algodón, cosechando moda [growing cotton, reaping fashion]’. This agreement will promote and expand textile industry in the entire province, so that it will not be concentrated only in the capital”. The event was also atended by Martín Lema, director of the Biotechnology area of the Ministry for Agriculture, Livestock and Fishing, and María del Carmen Alarcón, secretary of National Integration.